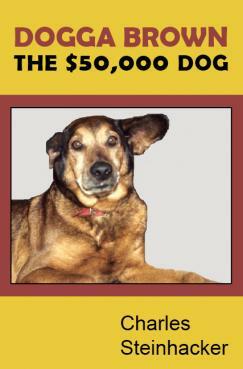 Dogga Brown: The $50,000 Dog is the story of the author's ill-fated entrance into the dog market back in 1966 when he purchased for a two-dollar contribution to the Humane Society one genuine brown dog. The purchase price for this animal turned out to be one of the most deceptive deposits ever put down on anything in the history of financial transactions. By the time the dog "crossed over" in 1981, her psychotic behavior had cost the writer over $57,000 and driven him into long-term psychotherapy with the eminent but highly eccentric Dr. Harry Frale. Charles Steinhacker is an internationally known photographer whose color images of the landscape, wildlife, architecture and abstraction have been featured in National Geographic, Life and many other major magazines. He has published four coffee-table books of his photographs, taught workshops throughout the country and is represented in museum and corporate collections. This is the first book he has published as a writer.